If you don't live near a large city, the following sell baking suppplies mail-order. I've found mail order to be more expensive (not including shipping) than stores, but I love looking at those catalogues! My husband's aunt highly recommends Zingerman's, which just defies description. Lemon and almond extracts: freshly-grated lemon zest gives a fresh and strong lemon flavor, but only if you have lemons on hand; almond extract gives an extra almond punch. Each trip to Germany, my mother swears she'll spend just one day eating Laugeweckle, rolls made from soft pretzel dough. German soft pretzels are similar to their Philadelphia/Amish counterparts, but with a chewier texture and more flavor. Laugeweckle are found only in the south, in Baden-Wurttenburg and Bavaria. And now, they are found in Georgia, USA, through Hofer's of Helen, who will overnight rolls and pretzels to the continental US. Admittedly, they aren't as good the next day, but they are still fantastic with honey and sweet butter. My husband found these, and they made the best anniversary present every. They don't have an encrypted web site for orders, but do take orders over the phone. When I made a wedding cake for a high school friend, I needed to find eight pounds of almond paste for six layers of cake. Sweet Celebrations had almond paste in seven-pound containers, cake circles, pans -- pretty much everything needed. When I needed everything within a week, they packed my order that day and I had it withing three days. Unfortunately, they don't sell on-line, but you can request a catalogue through the site. As a do-it-yourselfer, I hate throwing away a good appliance because one part is broken or missing: the lid on the coffee carafe, the rubber ring for the blender. Culinary Parts Unlimited comes to the rescue. They sell replacement parts and accessories for most national small appliance brands. Forced to select my favorite piece of kitchen equipment, I'd be hard pressed to choose between my stand mixer and my knives. A balanced knife that holds an edge makes cooking a joy. Knifemerchant.com has a wide selection at reasonable prices. My personal favorites are the Goldhamster/Eberhard Schaaf, not as well-known as Wüsthof or Henckels, and the better priced for it. However, if the dollar is low compared to the Euro, I suggest the Victorinox with Fibrox handles. Plastic, yes, but sharp. I find Victorinox particularly worthwhile for smaller knives, no matter how the dollar fares against the Euro. My first date with Jorj was to Fante's Gourmet and Kitchen Wares Shop. We wandered the aisles of the store in Philadelphia's Italian Market for three hours. Fante's offers very practical, good quality, and unusual kitchen wares at a reasonable price. The web design isn't beautiful, but, each page lists the length of shipping time to expect, and describes features to look for in picking the right equipment. Fante's offers Springerle molds, which are cheaper than, but not nearly as detailed as the House on the Hill. On vacation, Lynn and I discovered Utilities in Provincetown, Mass. It's a little smaller than Fante's, a little more upscale and less foodie, but I still could have spent hours in there. The on-line catalogue is fabulous, and the store has even more items. You can order a catalogue from King Arthur Flour Co. by calling 1 800 777 4434. In addition to the company's line of unbleached flours, the catalogue offers many tools for baking. There is no longer an on-line version of their catalogue, although the site is still up. The House on the Hill, Suite 301, 555 E. Butterfield Rd., Lombard, IL, 60148, sells Springerle molds, cookbooks, cookie flavorings, Hartshorn and other supplies for Springerle. Termini Brothers bakery is a Philadelphia staple. If you aren't up to baking your own cookies this year, check out their on-line catalogue. I would be remiss if I didn't mention these sites. Non-commercial listed first. Popular Science magazine explores why food does what it does, from baking to roasting. As much as my own focus is on my family's German-American traditions, all the world's traditions fascinate me, including Mexico, Ireland, Christmas Cake, Spain, and more Germans, and more Germans. Mini figures on food are funny. See for yourself. The web's come a long way since those first, silver, "All About Me!" days. Blogs have made it very easy for good writers to get their words in front of an international audience. Some of my favorites: Delicious Days, writing from Munich; Farmgirl Fare, which doesn't mean to be, but is a lesson in Where Food Comes From; Orangette, who could is turning pro; Meg's Food and Wine, because I want to live in a state without sane liquor laws; Foodmomiac, with a full-time job (she's a VP!) and two kids, she still loves to cook and gets good food into everyone; and Hot Water Bath, written by a woman I nicknamed "Marsha Stewart" more than a decade ago -- she puts me to shame and has since we were in German classes together. All too often, vanilla gets a bum rap, but it's really a complex flavor that gives depth to many foods. Slate magazine explains how it went from an exotic perfume in the age of exploration to boring in the age of information. Sherie has a collection of Austrian and German recipes that covers appetizers to desserts. She's an American living in Germany; the recipes promise to be authentic but without ingredients that are hard to find in America. It all looks very yummy! Most food magazines don't interest me -- how many ways can you serve caviar? (In my house, one: keep saving up for it.) I like Saveur for the food writing, Cook's Illustrated for the authoritative yet not impossible recipes, and Everyday Food for recipes that really are easy enough to cook on a weeknight and tasty enough to eat every day. Most general food sites don't thrill me, but Saucy offers personal essays on food, detailed coverage of basic foods like pie crust, and the funniest, most accurate reviews of food magazines. No, really, those reviews are funny! As a Philadelphia native, I generally do not like all things New York City. The food press all too often forgets there is more to American food culture than NYC and California. Food writer Regina Schrambling might be in New York, she might exhibit a snarkiness achievable by very few people outside New York, but she did work for the Philadelphia Inquirer in a past life and is really, really funny. Lots of in-jokes, so it's helpful to know the New York food scene, or at least watch the Food Network. Check out the Trails page, where she posts weekly restaurant reviews -- and she's had good things to say about my home town (mostly because we're cheaper than New York). Linus Feller sells reproduction Springerle molds. He's also written a wonderful book about the most German of cookies, and makes much of that information available on line at springerle.com - springerle molds from Switzerland, das Aenis-Paradies von Linus Feller. Not just German and Austrian recipes, but recipes in German (!) at Österreichisches Keks-Verzeichnis, aka the Austrian cookies directory. The Hung-Over Gourmet writes pretty well for a man with elephants dancing in his cranium. It's a zine! It's a web site! It's someone I knew at college (hi Dante)! He takes his food and drink seriously, but not himself. Breads, cakes and cookies will always be my favorite food, but my German heritage comes throught in my love of sausage and scrapple. Just don't eat anything with the word "blut" or "zung" in the description. June Meyer describes baking cookies with her Hungarian mother. The Society for the Preservation of Fruitcake has been established to preserve that holiday favorite of comedians everywhere. Mary Beth Goodman has collected numerous recipes, including a detailed description of her own, which, frankly, blows my grandmother's recipe right out of the water. The Jarmann Sisters have a site full of family Christmas recipes and family lore -- what a great idea! For an all-around cooking site, Mimi's Cyber Kitchen was one of the first and is still one of the best. Mimi offers up recipes, links and her own writings. My favorite is her efforts to write down her own Bubbe's recipes and interpret the recipes of a friend's grandmother. It's Tournament of Champions time, which usually means the Parade of Geeks. Revenge of the Autodidacts! Pillowy smart Rubenesque women with long wavy hair and the faint aroma of cats; goofy comb-overed Michelin men praying that one of the categories is ``Boer War Enlistment Slogans;'' ubernerd young guys who know absolutely everything there is to know, period, but have to be disuaded from larding their palm with Vaseline before they pick up the clicker and start to work. It's the only place on TV - well, that and Ben Stein's show - that actually doles out bags of cash for behaving well. I think the winner should also be allowed to take a baseball bat to a Jerry Springer guest of their choosing. It would send the right message. Italian Christmas Eve from EGG, the Electronic Global Gourmet. Good recipes along with a bit of explanation of Italian traditions. Also check out the Bill Gates gingerbread boys. Epicurious is the main site for Bon Appetit and Gourmet magazines. The home page is very graphics oriented, you may want the text-only version, which has only a few graphics, including advertisements. TVFN's site has been redesigned so that it is no longer so graphics intensive and downloads much faster. New for 2007! It's been a while, eh? Confession: I am a terrible bread baker. Or, I was, until I too found the secret of no-knead bread. Another confession: Anyone talking about no-knead bread sounds like they've joined a multi-level marketing scam. But no-knead bread is really and truly that easy to make, although it requires more than five minutes of time. The five minutes of the title refers to the time one is actively mixing and then forming the loaves. It doesn't count the two hours of for the autolyse reaction to "knead" the dough, or the time for the dough to rise and bake. Artisan Bread starts with a multi-pages long description of the basic recipe and technique. It's exactly what anyone who can't bake a good loaf needs, and is worth at least half the cost of the book. Love cupcakes? Buy this book. Baking for anyone who doesn't consume dairy or eggs? Buy this book. Think "green tea cupcakes" sound intriguing and delicious (they are)? By this book. Oh heck, just buy this book — it won't take up much space on your cookbook shelf, and is packed with easy recipes you'll make again and again. 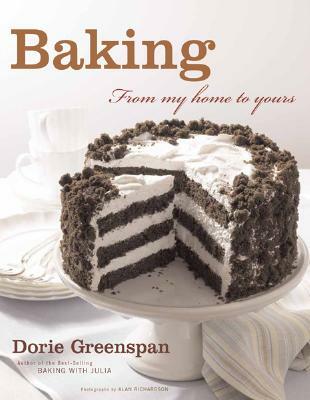 If you have only one baking book in your kitchen, you won't go wrong with Dorie Greenspan's Baking. She covers everything sweet from quick breakfasts like scones and muffins through restaurant-quality desserts. Recipes are well-written and unambiguous. On Food and Cooking: The Science and Lore of the Kitchen by Harold McGee is a definitive yet accessible work on food science. The second edition has reportedly been completely re-written, with lots of new material. A good reference if you want to go in depth without years of college studying. The Village Baker by Joe Ortiz, published in 1997 by Ten Speed Press is the cookbook for bread bakers. Ortiz clearly explains the details of European baking, including the necessity of long rising for full rich baking. He includes a number of German favorites, like pretzels and pumpkin-seed rolls. Baking German-style soft pretzels from this book was a culinary triumph for me. The Joy of Cooking: Christmas Cookies by Ethan Becker (son of Marion Rombauer Becker, co-author of Joy). Becker gives detailed directions for the cookies his family made and still makes at Christmas from Pfeffernuesse to "monster cookies." It's worth buying in hardback. Visions of Sugarplums: A Cookbook of Cakes, Cookies, Candies & Confections from all the Countries That Celebrate Christmas, by Mimi Sheraton, published in 1968 by Random House, is a veritable encyclopeadia of Christmas baking. Sheraton explores the cultures that celebrate Christmas, what they bake, and which of the associated holidays (St. Lucia, St. Nicolaus, Boxing Day) are identified with a particular culture. Out of print but worth finding used. The New German Cookbook, by Jean Anderson and Hedy Wuerz, published in 1993 by Harper Collins, is not a Christmas cookbook, nor a baking book, but does include very good recipes for Zimtsterne, Lebkuchen, Vanilleknipferl, Pfeffernuesse and others. Betty Crocker's International Cookbook, published in 1980 by Random House, also has holiday recipes scattered throughout. It is also a good general book for beginning cooks interested in ethnic foods. If you speak German, Backideen: Backen koestlich wie noch nie, by Annette Wolter, published in 1989 by Graefe und Unzer GmbH, is a wonderful baking book in and of itself, with a chapter devoted to Christmas cookies. This is a country that takes Christmas baking seriously. Christmas Cookies Are for Giving is a lovely volume of recipies and heartwarming stories to which I contributed the story of burning out my mixer motor with my then-boyfriend, now husband. Many recipes and seasonal stories. It's never enough to know a good recipe; it's important to know why the recipe works too. Shirley O. Corriher's Cookwise provides both. For anyone interested in cooking, I would recommend this as the second cookbook to buy, after purchasing one of the standard, general-interest encyclopaedias like Joy of Cooking or The New Doubleday Cookbook. Corriher is a food scientist frequently seen on Alton Brown's television show. Her book has been invaluable in testing recipes for this site. Maricel E. Presilla's fantastic book, The New Taste of Chocolate discusses the culinary, biological and political history of my favorite fruit: the cacao pod. Presilla is chef and co-owner of the Cuban/pan-Latin restaurant Zafra in Hoboken, where she does things with chocolate that I can only dream about. Her writing is as good as her cooking; I was quickly converted to the need for preservering the biodiversity of the cocao plant.